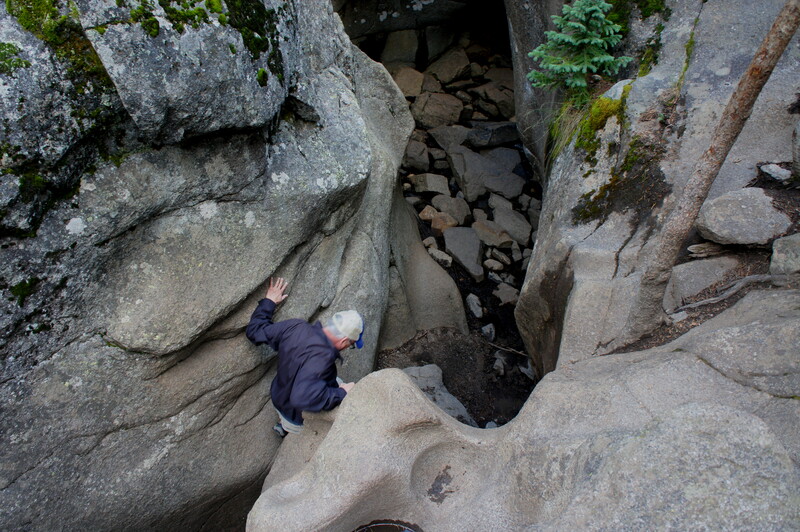 Situated just off Colorado’s Highway 82 west of Independence Pass, the short but spectacular Grottos Trail is a must-see in the Aspen-Leadville area. 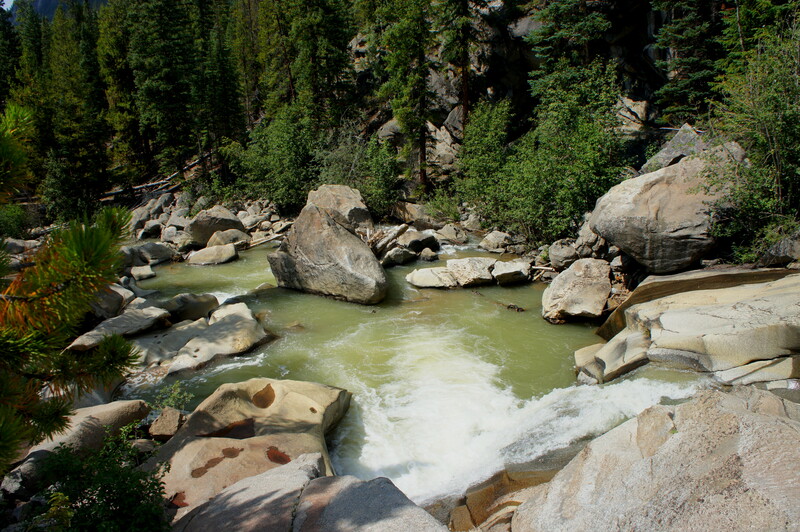 In the course of 1/2 mile, the stem-and-loop visits both a splendid set of tumbling cascades on the Roaring Fork River and an undulating slot canyon, the latter a rare sight in Colorado. 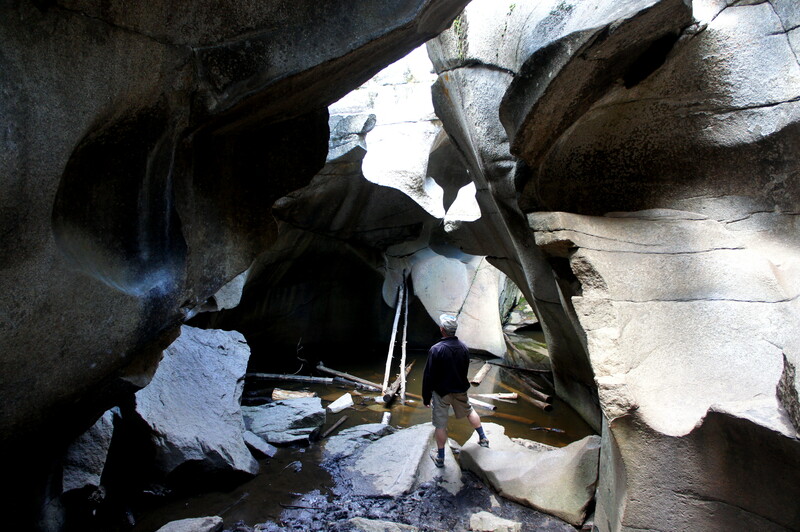 Nominally known as the “ice caves,” this dazzling chasm requires a bit of climbing skill to reach—but the rest of the circuit hike is relatively straightforward as it winds around and over huge hunks of smooth granite. 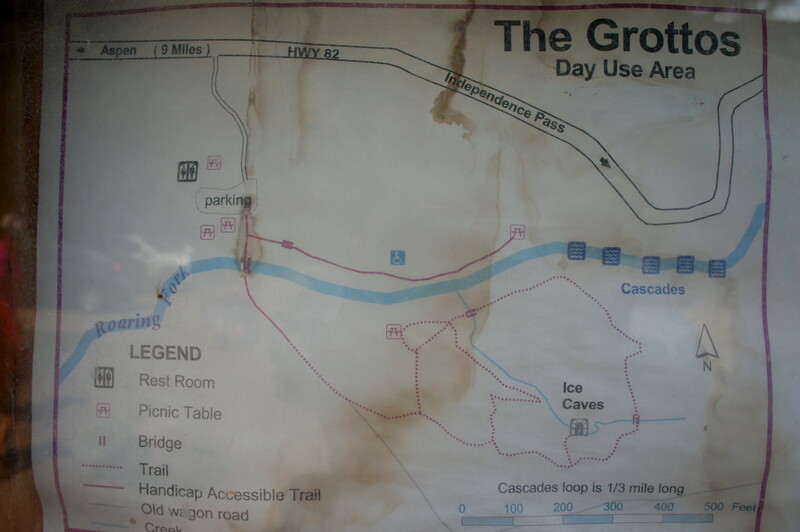 To reach the Grottos, drive east from Aspen for approximately nine miles on Highway 82, looking for signs on the right marking the Grottos Day Use Area. Conversely, the trailhead is situated almost 11 miles west of Independence Pass. There are picnic tables scattered about, as well as a pit toilet. 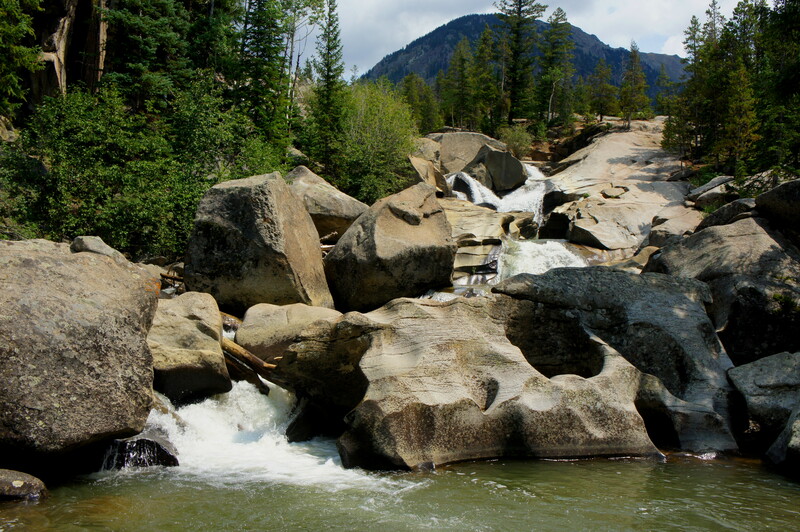 Before crossing the Roaring Fork River, first follow the level, handicapped-accessible trail that skirts the northern bank to an excellent viewpoint of the rushing cascades. 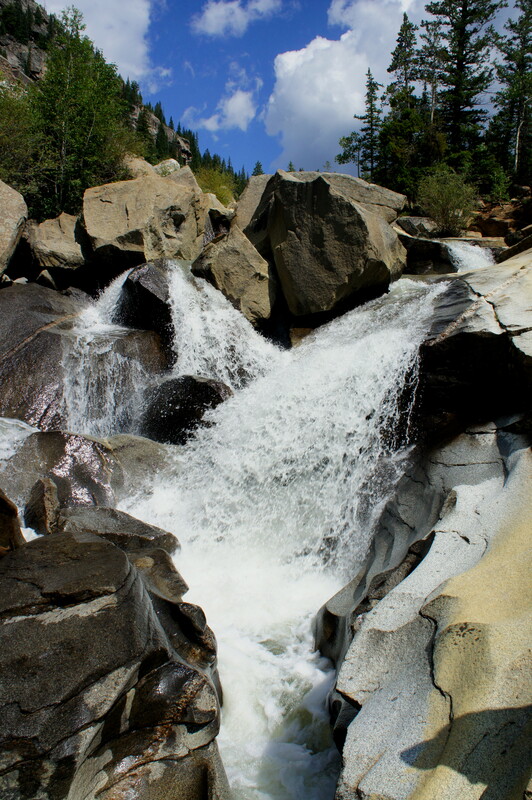 Despite the name, the impressive flow and drop of the chute could easily be considered a waterfall in its own right. Adding to the allure is the smooth bedrock through which the falls slice. There is also a picnic table at the end of the trail. For around 1/10 mile, the narrowing trail beyond climbs amid spruce and pine trees to a second junction, this time indicating the start of the detour to the ice caves. Descend the rocky steps to get your first view of the slot from above. 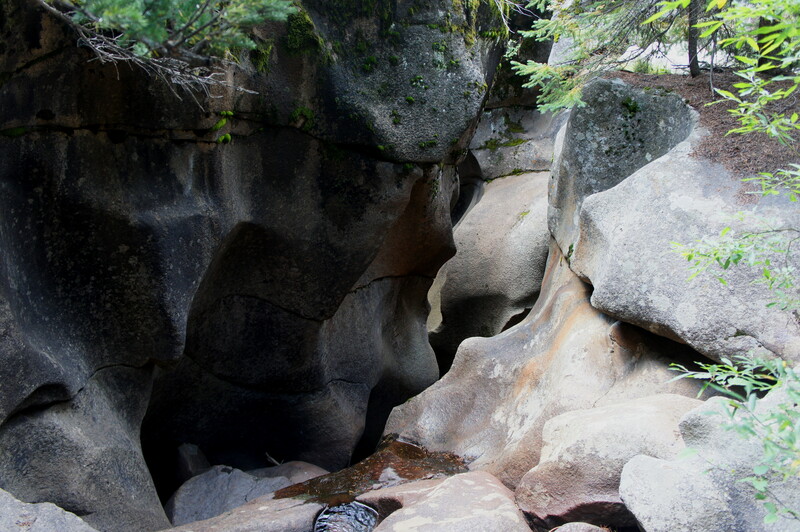 The trail leads down to a narrow pinch in the slot, the most viable entrance to the ice caves. 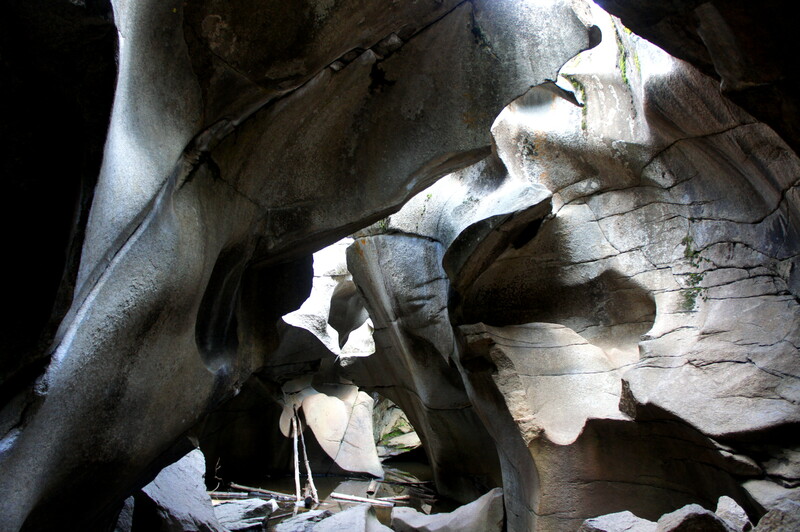 (Note: “Ice caves” is a deceptive term, as the passage is not entirely enclosed; it more closely resembles a slot, with light entering from above.) Entering the slot requires sure footing and a couple nimble moves; it is possible to chimney down by using the opposite wall to ease the descent. Most will be able to complete the entry but should use caution—dropping off to the left could cause injury, or at least an unpleasant dip into icy cold water. Being a slot carved by ice, the passage is partly filled with water, and all but the bravest will probably limit their visit to the impressive opening chamber, which is likely to be mostly dry in summer. Downstream, the slot becomes brushy and mostly flooded—an adventure probably best avoided. With light bouncing off the undulating walls and the murky waters, the rock cavity into which you drop is an eerie and beautiful sight. The entry forms a small archway, and the ceiling above is actually a natural bridge between two sun-soaked cavities. Be careful when entering the chamber—seemingly not a single rock lays flush with the floor. After spending a good while taking in the unique sight, shimmy back up the pinch and out of the ice caves, then return to the main trail. The route winds east, then north, and crosses a wooden bridge at a second entrance to the ice caves, this one far more treacherous. 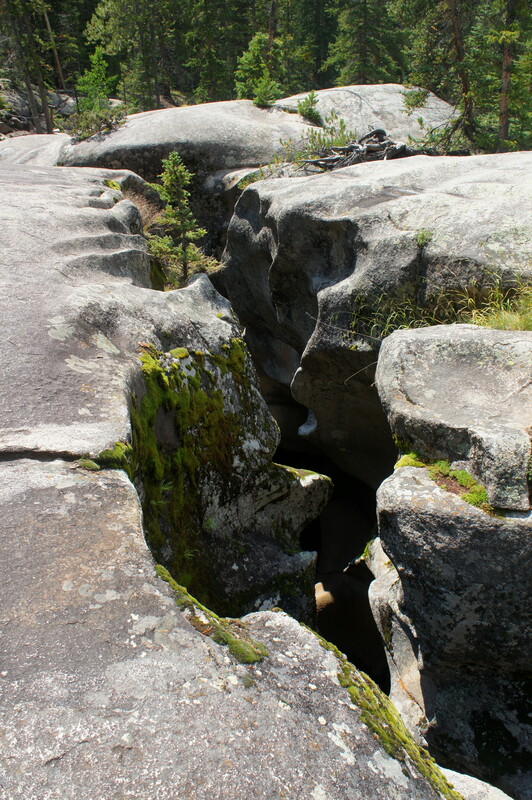 Here the slot cuts some 30-40 feet deep into the granite and narrows to about 3-4 feet wide. Continuing on, it’s a couple minutes’ walk to the cascades, this time approached about midway up the falls. Be very cautious—in 2008, a Florida man died trying to save his wife, who had slipped over the edge into the rushing chute. The final leg comprises a roller coaster of sorts: roughly following the southern bank of the Roaring Fork River, the trail ascends stairs and descends rocky slopes before crossing a minor drainage. Shortly after reaching the aforementioned shady picnic spot, the Grottos route returns to the main junction. Retrace your steps for the final 1/10 mile back to the parking area. Allot around an hour to fully appreciate the cascades and ice caves. This entry was posted in Colorado, Moderate Hikes, White River National Forest and tagged Aspen, cascades, Colorado, granite, Grottos, Grottos ice caves, Grottos Trail, ice caves, Independence Pass, loop hike, Roaring Fork River, slot, The Grottos, waterfall, White River National Forest. Bookmark the permalink.